This story is part of the Metropole Journalism Championship, a joint effort between METROPOLE and American International School Vienna. Read the stories of the other finalists and vote for your favorite here. The Naschmarkt shows Vienna from its most colorful and diverse side. You smell it before you see it. The faint aroma of exotic spices lures you from the side streets into the cramped alleyways of the Naschmarkt, Vienna’s largest open-air food market. Each stand buzzes with activity, barkers praising the quality of their produce. Proof positive of Vienna’s melting pot, they embody diversity and global trade – in the best broken German around. There’s no way I could possibly sample every stand, but I can certainly try to do so. The lion’s share of the market is a booming, busy bazaar full of sizzling meat, fragrant spices and vivid colors. 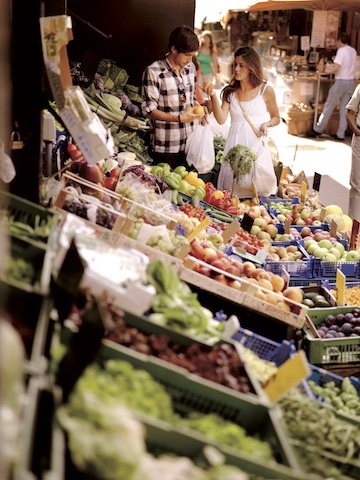 Full of delicacies from the world over, wherever I turn, a hand reaches out holding a caramelized nut or a green olive stuffed with feta cheese – free samples are commonplace when walking through the crowded aisles between stalls. A large number sell Baklava, a pastry popular in Turkey and the Balkans. Thin, thick, stringy, crusty, crispy –the choices are unlimited, all of them swimming in glistening honey. Their sweetness soon gives way to the spicy whiff of red paprika, cinnamon and curry powders from the stand next door. Fresh fruits and vegetables are hawked by market ladies, yelling that their tomatoes were just picked and that squash is in season. The strawberries look so red and fresh that they are truly hard to resist. Entire sections are dedicated to bread and pastries from all over the world. Run by a woman and her son, a stall I frequent regularly sells containers with pink, green and red sauces out of a large refrigerated counter. The woman catches me eyeing her falafel, which looks so appetizing, and offers me a sample. It is warm, crispy, spicy – and sells at 20 for €2. Unable to resist such a bargain, I order 40 for €4. While she fills a plastic bag, I ask her where she is from. She eyes me slightly suspiciously: “I’m from Russia. Ex-Soviet country.” She then hands me my falafels, and I pay before moving on. Three men sit in a booth, one stirring stew in a large pan, another adding spice after spice and the third standing over bowls of vegetables, sauces and herbs. I ask about the dish and where it originated; they reply, “It’s a mixture called shakshuka. It’s from Israel.” Despite the vague description, I order one. The trio, two from Israel and one from Bangladesh, stuff a pita with their mixture, adding spices and all types of vegetables. I take a bite into the mouthwatering mystery, finding myself unable to place the dozens of exploding flavors overwhelming my taste buds; yet it is delicious. If you are looking to make a unique meal, the Naschmarkt can provide the ingredients. One small shop sells a variety of products from Asia. I buy ingredients for a Thai dinner, as well as a bag of curry. I ask the shop owner’s opinion, who is from India, and she gives me advice on the best curry and other ingredients. Bargaining in markets is commonplace, and the Naschmarkt is no exception. A small man with a large black hat and John Lennon sunglasses beckons me into his carpet stall before I have a chance to refuse. “Romanian, from Transylvania! Babushka make, handmade,” he says. The man shows me carpet after carpet. The vibrant turquoise and pink pastels engulf my eyes, causing my head to spin. The weight of each carpet sits in my arms, making them itch from the wool. “Good price! €150!” I decline his offer, which decreases with every step I take in the opposite direction. The street vendors, with their tarps, boxes and tables descend upon the Naschmarkt early every Saturday morning. By noon, a sea of bric-a-brac, trinkets, and antiques nearly doubles the size of the market, covering a vast space as far as the eye can see. The Flea Market or as the Viennese call it, the Flohmarkt, may look like discarded odds and ends, but beyond the knock-off Michael Kors purses and old Barbie dolls, are treasures and stories. Many of the vendors come from outside Vienna and sell objects from their home countries. “I’m selling from Cameroon,” says a lady hawking beaded tribal masks of animals. “The money from the masks goes to orphans back home. I bring it back every year.” Standing in a long fur coat, she expresses her deep admiration for her home country and the warmth she misses. Her pride in helping orphans is evident in the freezing March weather. Every table or blanket you walk by will have something enticing to catch your eye. It might be an old, rusty faucet or a solitary red stiletto shoe, but every table has a unique tale to tell. I’m flipping through an assortment of Polish pottery when a woman wrapped head to toe in different colored shawls pulls a suitcase across the cobblestones. Looking cautiously left and right, she sets her suitcase down and opens it to reveal boxes of perfume. People race over and shuffle through Dior and Guess perfumes she sells for only €20 a piece. When the authorities strolls by, the woman slams the suitcase shut and splits, sale or no sale. Not only are the vendors interesting, but so are the buyers: Many young, urban hipsters come to dig through the jumble of used clothing, dirndls and shawls. Others come to look for collector’s items and specific antiques. “Oh mein Gott!” A woman exclaims while picking up a Blondie record found in an old cardboard box that once held bananas. She rushes off to show her delight at finding the vintage piece a man dressed in corduroy. A large portion of the Naschmarkt has made way for restaurants and cafés, popular among Viennese and tourists alike; between sellers yelling at the street performers, an accordion playing in front of a Mediterranean restaurant and locals chatting while stirring their cappuccinos, it is nearly impossible to hear the person next to you. “Chinese” restaurants manned by people of all nationalities sell fried noodles in paper containers to go; Crowds congregate at the popular cafe Do-An for afternoon coffee, basking in the sun’s warmth; Italian restaurants serving squid risotto or pasta pomodoro; And at the very end of the Naschmarkt, the restaurants and stalls start to dwindle down until only Wienerschnitzel and sausage stand are left, marking the transition from the bazaar back to Austria. Was this your favorite story? Great! Vote below! Still not sure? Here are the other stories.